Shanghai Optics offers a large variety of custom IR Lenses for high performance across a large portion of the infrared spectrum. 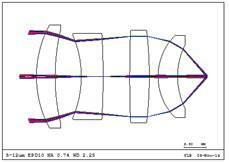 With our comprehensive manufacturing capability of IR lens components, our optical engineering team’s experience contributes to our unique IR objective lens development techniques. We are able to produce infrared lenses tailored to your needs. Our optical design team has been working on providing customer IR imaging solutions for over 20+ years. From applications adapting IR thermal display, thermal imaging system, and temperature detector, our effective design has been widely utilized on surveillance, IR magnification, IR zoom systems both in domestic and oversea markets. Especially for SWIR lenses, Shanghai Optics has existing high performance solutions which delivers distinguished image quality through visible range, also providing promising crystal clear thermal images though 700-1900nm, with totaling 80+%transmission. These IR lenses can be used in industrial, medical, scientific and military applications. Every single design performance will be approved by Shanghai Optics state of the art metrology using ImageMaster® Universal – MTF Testing in the Spectral Range UV-VIS-NIR-SWIR-MWIR-LWIR, transmission, EFL, MTF etc. Everything can be measured in house, and not to mention we perform full inspection on components characteristics according to customers’ specification. We strictly control each optical component quality in production to ensure a system level success. With our IR expertise and flexibility, customers with IR lens application needs are able to achieve their innovational concept and special requirement via Shanghai Optics IR design service, from simple fixed-focus objective lens and complex opto-electro-mechanical modules.